Backsplash or Paint: What Does Your Kitchen Need? The kitchen is a well-used room in the home where food is created and memories are made. Since it’s one of the places both your family and your guests will spend a majority of their time, it’s important that you maintain the upkeep it properly! The moisture, odors, grease and food splatter end up taking over the room if it isn’t maintained properly. When it comes to finding the easiest material to preserve, what should you use: a backsplash or paint? A backsplash is often the best thing to use in a kitchen. Placed right where the counter meets the wall and often as high as where the cabinetry begins, the backsplash protects the wall from becoming stained, dirty or unappealing in general. Backsplashes are made out of many non-porous, smooth materials and is easier to wipe clean than a painted wall. This detailing is usually made of acrylic, porcelain, glass or metal, and these materials can be simply wiped clean when food splatter, water or grease is present, making them ideal for the kitchen. With paint, the cleaning solution and harshness of the rag will eventually take away the color and make it look visually unappealing. Not to mention, grease and food stick to paint as it is more porous and textured. While paint is okay throughout the rest of the kitchen, it’s suggested that a backsplash be added above all counter space. This includes behind the kitchen sink and stove, as well as other areas where food is prepared often. This will help you to keep your kitchen looking its best even when you have less time to clean. 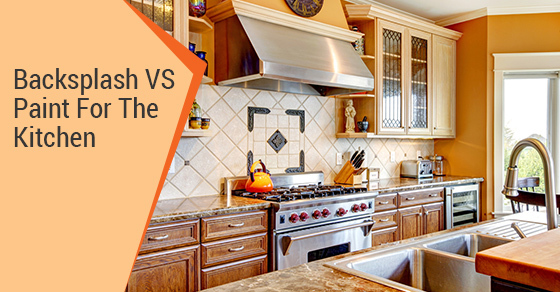 The question usually isn’t whether or not you should choose between the two, since a backsplash is undoubtedly the better option of the two. Instead, the question is what kind of backsplash you should have installed! From large tiles to mosaics, the options for aesthetically pleasing backsplashes are as diverse as your imagination. Take into consideration your kitchen’s existing home décor including colors, styles and themes. These will be the biggest aspects of your decision, as you want to find something to tie your whole room together. For a better idea of what would work best in your space, contact the experts at Avonlea! We’ll help you choose or design a backsplash that will keep your kitchen clean and appealing for years to come.